Gardenias, evergreen perennial shrubs valued for their fragrant flowers and attractive foliage, grow in China and Japan as natives, and thrive outdoors in southern, frost-free areas of the United States. In areas of the country where winter frost is a threat, gardeners raise gardenias in pots indoors. 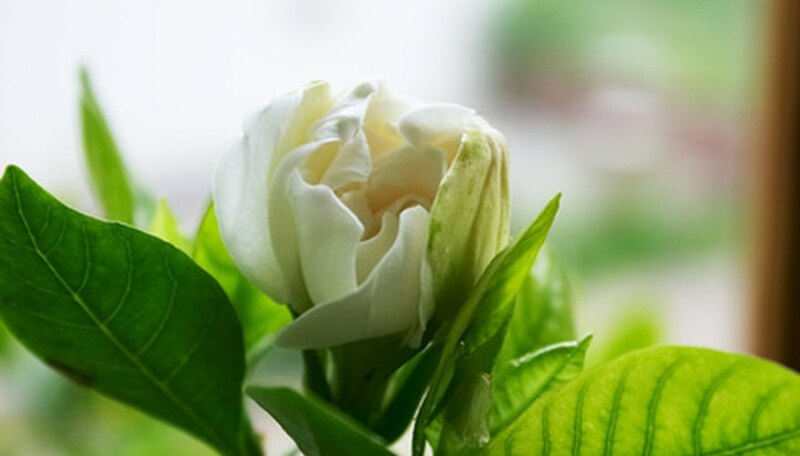 Gardenia shrubs do not tolerate household conditions well, however, and require special care to thrive indoors. The plants are well-suited to container growing, as long as the proper environmental conditions are provided. Warm, humid air and adequate water and nutrients ensure your container-grown gardenias reach their growing and flowering potential. Plant gardenias in a medium-sized container filled with a well-drained, organic potting soil mix. Keep the plants in a location that receives bright, direct sunlight throughout the day, such as a south- or west-facing window. Maintain a constant temperature of about 60 degrees F at night and 70 to 75 degrees F during the day. Keep a thermometer near the plant to ensure the temperature does not rise above or drop below the desired range. Fill a shallow tray with pebbles, and then add water until the pebbles are covered. Place the planting container on top of the tray to increase the relative humidity of the plant's immediate environment. Water gardenias when the top 1 inch of soil is dry, about once every five days. Soak the soil to ensure the roots come into contact with plenty of moisture. Reduce watering frequency to once every two weeks during winter. Feed plants once each month from April to November using a fertilizer specially designed for acid-loving plants, such as an azalea fertilizer. Apply according to the manufacturer's directions for the best results. Prune gardenias during late winter, just before new growth begins in spring. Use pruning shears to trim away any excessively long or damaged limbs to encourage a compact growth habit and promote new growth. Repot your gardenias when the roots begin to grow out of the bottom of the container, about once every two to three years, to provide a fresh growing medium and additional room for growth. Use a pot about 3 inches larger in diameter than the previous container. In USDA hardiness zones 8 through 11, container gardenias placed outdoors in a sunny area will thrive year round following the same care guidelines for indoor plants. In all other zones, grow gardenias as houseplants to prevent cold damage. Place a humidifier near your gardenias as an alternative to the pebble tray, if desired.